A number of popular scapegoats emerged in the aftermath of the financial crisis: conflicted credit rating agencies, a corporate culture and regulatory environment that encouraged risk taking over risk management, lax lending standards, rapid growth in credit, and what some considered to be excessively loose monetary policy from the U.S. Federal Reserve which was seen to facilitate the boom and bust in housing. A decade on, the Federal Reserve Chair at the Jackson Hole symposium last week, chose to deliver a speech devoid of any signals about the future trajectory of the key policy interest rate, or reflections on its historical path. Despite some misgivings from John Taylor (pioneer of the Taylor rule), history is likely to be kind to the Federal Reserve in the run up to the financial crisis. Both Messrs Greenspan and Bernanke admitted in various speeches in 2004 and 2005 that at the time, monetary policy had little influence over long term interest rates. Mr Bernanke attributed persistently low long term interest rates in the mid-2000s, in the face of a series of hikes in the policy rate (Greenspan’s conundrum), to a global glut in saving. Further research since then suggests that a lift in the demand for safe assets at a time when a global shortage in safe assets emerged (and remains), has been the source of the slow recovery and the secular decline in the neutral rate of interest. The importance of these global imbalances versus the role of monetary policy in contributing to the crisis remains subject of debate (but less so than five years ago). The key consensus that has emerged since the financial crisis is the vulnerabilities of the financial system, specifically banks whose loss absorbing capital buffers were too thin and a growing shadow banking sector globally that had managed to go under the radar of regulatory oversight. It is therefore no coincidence that Ms Yellen’s speech a decade on from the crisis focussed on developments in financial stability; how the fragility of the financial system at the time propagated the crisis, and how policy measures adopted since have helped to increase the system’s resilience, and reduce, the risks of another global financial crisis. The speech represents a sting in the tail for President Trump and his senior economic advisers; Ms Yellen warned about growing complacency around renewed financial sector stability and drew attention to the risks of rolling back some of those reforms. 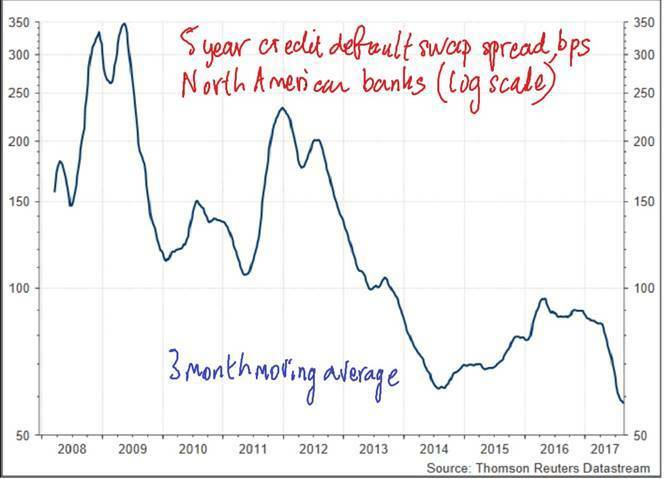 Few would argue that the US banking system today is safer than a decade ago, reflected in the fall in credit default swap spreads back to levels that remain low by the standards of the past decade (see chart). The two key developments that have reduced the financial system’s vulnerability relate to maturity transformation and capital. In recent years, banks have shifted away from run-prone short-term wholesale debt towards more stable sources such as customer deposits. Large domestic banks have also significantly boosted their holdings of high-quality liquid assets, making them resilient to funding stress. Second, the loss-absorbing capacity of banks has increased thanks to more stringent capital adequacy standards. 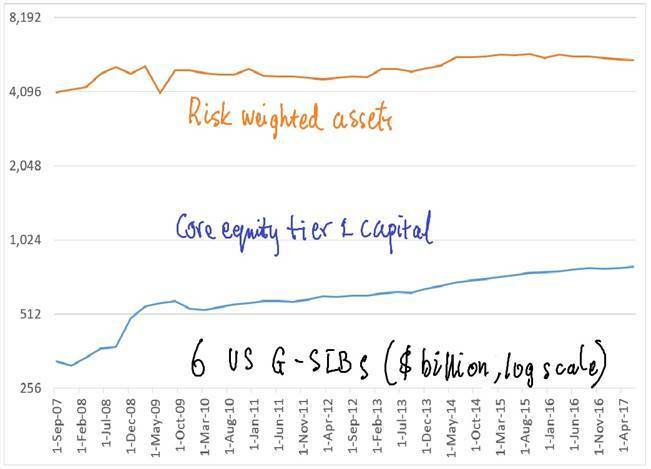 Although risk weighted assets of the six largest global systematically important banks (G-SIBs) in the United States – JP Morgan, Citigroup, Bank of America, Bank of New York-Mellon, State Street and Wells Fargo – have grown over the past decade, core equity tier 1 (CET1) capital (the strongest form of capital) has grown faster (see chart). Risk weighted assets are the total of all assets or loans written by a bank weighted by credit risk; more risky loans such as commercial loans attain a higher risk weight than residential mortgages for instance. Banks are required to raise more incremental equity finance to fund a loan with high credit risk, than a low risk loan. Consequently, the quantity and quality of capital required relative to risk-weighted assets have been increased substantially. 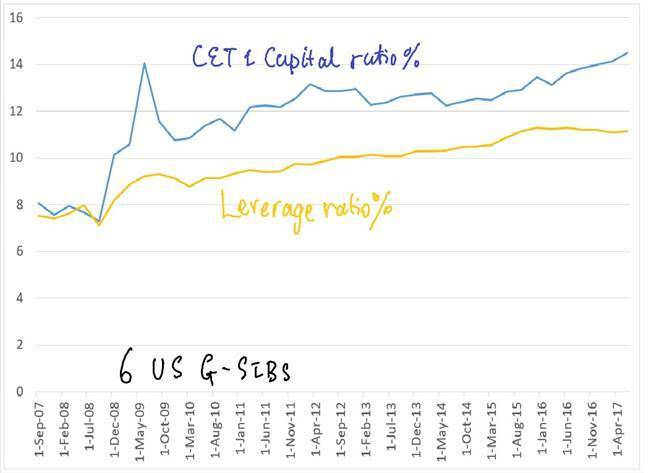 The aggregate CET1 capital for the six G-SIBs has almost doubled in the past decade to over 14% of risk weighted assets. The leverage ratio – which represents the ratio of shareholders’ equity to total bank assets (which does not discriminate loans based on different risk weights) has also risen to a decade high (see chart). But is this holding back growth? Ms Yellen posed the question of whether the safer banking system associated with regulatory reforms was supporting or hindering economic growth. Some have suggested that the new bank capital requirements are onerous and so are curtailing the ability and willingness of banks to lend, thus restricting the supply of credit and dampening animal spirits in the corporate sector. The evidence lends little support to the view that reforms designed to increase the financial system’s resilience have constrained the aggregate supply of credit. 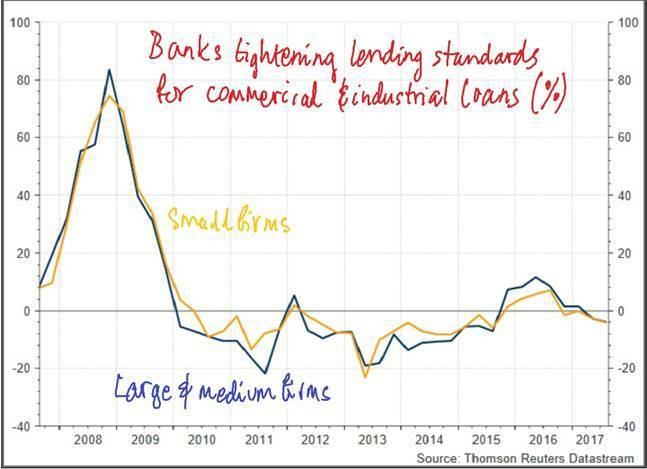 The quarterly survey of loan officers conducted by the Federal Reserve shows that since 2010, banks have been loosening lending standards for commercial & industrial loans most of the time, including now. Evidente has previously suggested that stock market volatility in the United States remains subdued – which in turn is contributed to elevated valuations by historical standards – in part thanks to record low financial sector leverage. Any moves by the Trump Administration to roll back some of these regulatory reforms would risk undermining the renewed resilience of the financial system. Any change in the leadership at the Federal Reserve is worth monitoring closely for more than just the future path of the Fed Funds rate.